As the host of many noteworthy events, including this year’s Hospitality Design Exposition and Conference (HD Expo), the Mandalay Bay Resort & Convention Center in Las Vegas is growing its footprint and we’re pleased to see it taking environmental concerns under consideration. Expansion plans for Mandalay Bay include the addition of over 350,000 square-feet of exhibit space to the existing 1.7 million square-foot convention center, as well as a carpeted ballroom space and a solar rooftop that will produce 3.4 million kilowatt hours – generating enough electricity to power 1,300 homes. With construction scheduled to start in late fall, the space is expected to be completed by August 2015. Though construction of this scale will inevitably be costly – and time consuming – MGM says it plans to uphold its eco-friendly reputation and build to meet or exceed LEED gold standards. 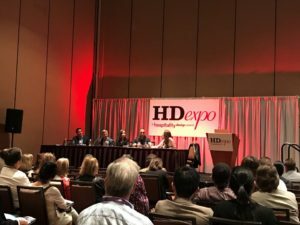 The HD expo is designed to bring hospitality professionals together from designers, to architects, to purchasers in an effort to encourage idea sharing, innovation and inspiration – and what better venue that the Mandalay Bay. Once the work is finished, the center will boast a total of 1.1 million square-feet of exhibit space.